The highly digestible ingredients and low fat content make it an ideal food for those with poor digestion. A nutritious combination that, because of its soothing properties and high digestibility, has been traditionally used for weaning young animals and for convalescents during the recovery period following illness. 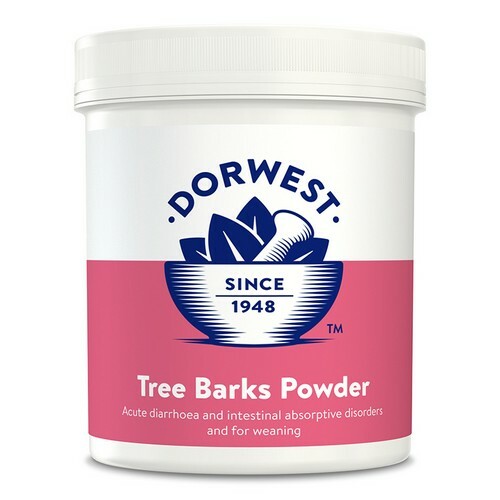 It soothes the entire digestive system and helps to slow the passage of food through the digestive tract, so is of great benefit for acute intestinal absorptive disorders and can be given both during and in the recovery period following acute diarrhoea. It may be given as required for short-term use or indefinitely if necessary for conditions such as exocrine pancreatic insufficiency. It can be given mixed with live natural yoghurt or water or can be simply sprinkled onto the food if preferred. Can be given from weaning and can also be used during pregnancy and lactation. Also available in 200g and 400g pots. How Much Tree Barks Powder Do I Need to Give? 1 teaspoonful per 10 kgs bodyweight daily. Can be increased or given with each feed if required for more severe cases. Fine Powdered Slippery Elm Bark 90%, White Poplar Bark 10%. Contains only plant material conforming to British Herbal Pharmacopœial specifications.